The hell cannon (Arabic: مدفع جهنم) is a general name used to describe a class of mortar-like improvised firearms in-use by insurgent forces during the Syrian Civil War, mainly in the Aleppo area. It was first noted in 2013 and a number of home-made cannon variants have appeared in Syria since. In Aleppo, the Hell Cannon is associated with one of the most famous fighters in Anadan, named Jamil Kadour, who had close ties with Khaled Hayani. Kadour went from being an auto mechanic to booby-trapping vehicles and repairing weapons, then to manufacturing bombs and cannons. He was killed by ISIS members and his body was found in a mass grave at the Institute of Electricity near Haritan. An opposition source said Kadour was killed because he refused to work with ISIS outside Anadan, demanded exorbitant prices for repairing weapons and equipping the Hell Cannon and preferred to manufacture arms for their arch-enemy, Khaled Hayani. 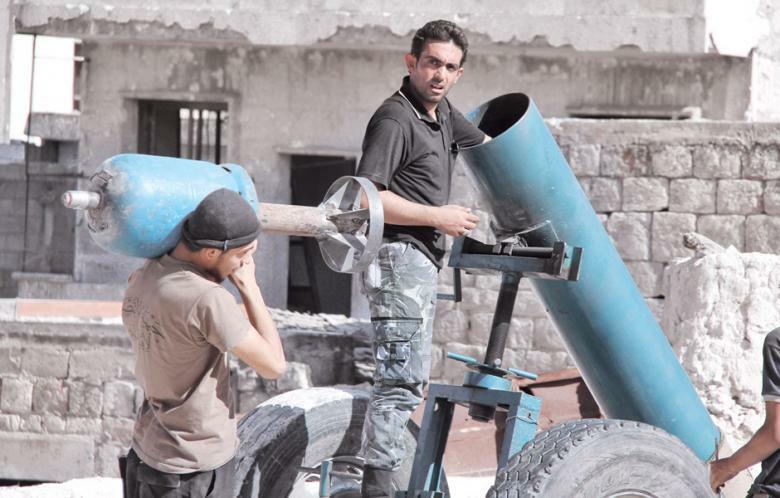 Although invented in the Idlib countryside, the hell cannon is primarily used in the Aleppo area for urban warfare. The cannons medium range (about 1.5 kilometers) requires the enemy to be nearby, but also for the cannon to remain hidden from counter fire due to it being unarmored. Thus the Hell Canon is vulnerable in the open countryside but in cities a combination of close quarter fighting and the ability to hide behind walls and buildings give it an advantage. The cannon barrel is about 3 feet long, mounted on wheels and towed. It is muzzle loaded. Explosive powder such as ammonium nitrate is first dropped into the muzzle and ramrodded with a wooden stick. The projectile is a re-purposed gas cylinder filled with explosives and shrapnel (the payload). Welded to the payload is about a 2 foot metal tube (the tail) about the same circumference as the cannon's muzzle. The full length of the tail is inserted into the muzzle, forming a tight seal inside the cannon. The payload remains outside the muzzle but still attached to the tail now inside the cannon. When the cannon is fired, the force of the explosion takes the path of least resistance pushing the projectile towards the target at high velocity. Flight stabilizing fins which are part of the tail ensemble ensure the cylinder doesn't tumble. The projectile weighs up to about 88 pounds with three quarters of the weight as explosives. The projectile reportedly has a range of 1.5 kilometers. There are believed to be 20 such cannons as of December 2014. An (as yet) unnamed variation uses a projectile similar to the hell cannon (a blue gas cylinder) but the tail fins form a flat base. The entire projectile is inserted into a larger diameter cannon, which is the maximum diameter of the projectile. [see image]. The Hell Cannon was followed by the Jahim (Hellfire) Cannon in 2013. This model can fire large ordinance such as water heaters or oxygen cylinders weighing as much as 661 pounds. It was first used in Aleppo's Ashrafieh neighborhood and was also used to attack the Citadel of Aleppo. Hellfire cannon mounted on a tractor.. Both previous hell cannon models suffered from lack of mobility, resulting in loss of life to soldiers. The Our Lord Omar bin al-Khattab cannon attempts to address this by mounting a Jahim (Hellfire) Cannon directly on a tractor frame which can be driven, thus making it easier to quickly move and aim. It does not need to be towed. As a Hellfire Cannon it could fire gas cylinders and water-heater filled bombs. Quad hell canon mounted on tractor. In March 2015, a 7 barrel hell cannon appeared. It is named the Bureij after a Palestinian refugee camp in Gaza. According to the Britain-based Syrian Observatory for Human Rights, as of December 2014, hell cannons are "wildly inaccurate" and have killed over 300 civilians, most of them in Aleppo. ↑ "Terrorist attacks with gas cylinder bombs cause civilian injuries in Daraa". SANA Syrian News Agency. December 11, 2014. http://www.sana.sy/en/?p=21349. Retrieved December 24, 2014. ↑ "Syrian rebels introduce the "hell cannon"". New York Times. August 22, 2014. http://www.nytimes.com/video/multimedia/100000003070562/syrian-rebels-introduce-the-hell-cannon.html. Retrieved December 13, 2014. ↑ 3.00 3.01 3.02 3.03 3.04 3.05 3.06 3.07 3.08 3.09 3.10 3.11 3.12 3.13 3.14 3.15 3.16 3.17 3.18 Basel Dayoub (December 5, 2014). "After ‘hellfire’ and ‘hell:’ meet the Syrian rebels’ new rocket in Aleppo". Al Akhbar. Archived from the original on March 25, 2015. https://web.archive.org/web/20150325192010/http://english.al-akhbar.com/node/22772. Retrieved March 25, 2015. ↑ 4.0 4.1 Brown Moses (23 May 2013). "DIY Weapons In Syria - The Hell Cannon". Brown Moses Blog. http://brown-moses.blogspot.com/2013/05/diy-weapons-in-syria-hell-cannon.html. Retrieved December 13, 2014. ↑ "Syrian Sunni Arab citizen soldiers open fire with their new seven round Hell-Cannon: Bureij". LiveLeaks. March 16, 2015. http://www.liveleak.com/view?i=d75_1426503182. Retrieved March 29, 2015. ↑ Oliver Holmes (December 12, 2014). "Syrian rebel 'hell cannons' kill 300 civilians: monitoring group". Reuters. https://news.yahoo.com/syrian-rebel-hell-cannons-kill-300-civilians-monitoring-122622024.html. Retrieved December 13, 2014.